There is metered street parking and lots throughout the area. Award-winning restaurant designs, playing on the architectural elements of the spaces and materials, will serve as the perfect backdrop for any occasion. Now nestled in what was an old bank in the heart of Ridgewood, our restored vault, high ceilings, mezzanine, and rooftop bar provide a captivating and unique space to hold various types of events from weddings to corporate parties. We offer private and semi-private restaurant space in addition to our event space in the grand ballroom. On site event planners will assist you with every aspect of your event. Call us or send an e-mail to Info@EatDrinkCelebrate.com to book your next event! 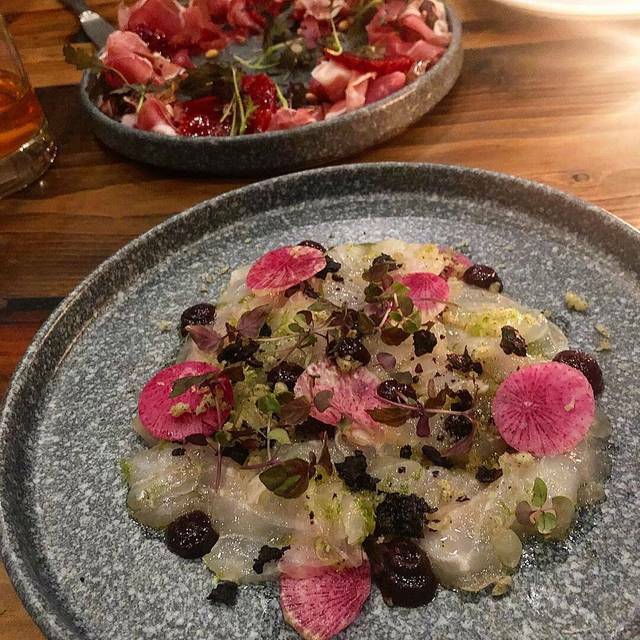 Felina will feature knowledgeable, hospitality-focused professionals showcasing locally-grown and foraged cuisine with authentic and vibrant Italian influences. Frank Cretella and Chef Anthony Bucco developed the Felina brand to offer a refreshingly unique Italian restaurant experience. True supporters of the family farmer, artisans, and craftsmen, we take pride in our approach to community and sustainability. Our food and beverage programming will both rely heavily on the seasonal harvest to showcase each articulated and perfectly in-season ingredient. Award winning restaurant designs, playing on the architectural elements of the spaces and materials will serve as the perfect backdrop for any occasion. Food, service and ambiance were all outstanding. Already booked our next dinner there in May! One entree out of 3 was not edible. Restaurant policy is not to allow any app orders until entire order is ready to be placed. Dessert was mediocre at best and tiny portions. Lovely setting and delicious food but it’s too loud! Dined this past Sunday - Glad we went during s slow time based on all the reviews saying it gets very noisy during peak busy times - We enjoyed a nice, leisurely meal - All of our servers were very attentive. 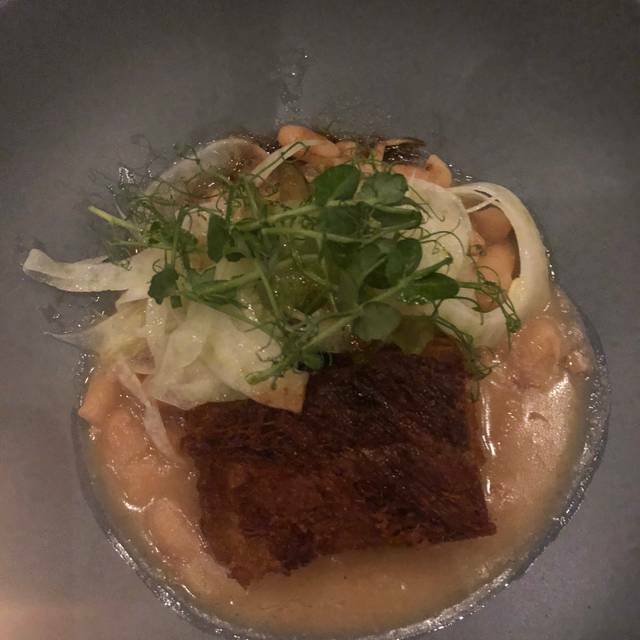 My husband loved his short ribs and my friend enjoyed the octopus and rye gnocchi dishes. My scallop dish was excellent, scallops cooked just right. The bucatini pasta dish is nothing special, and it's disappointing that for the prices you are paying they don't give you complimentary bread - we ordered the focaccia for $6, which although a decent portion if you are looking for traditional, authentic focaccia this is not it. My friend and I shared the tiramisu which I was so excited to try, but it was just ok. Beautiful presentation but I prefer a creamier, moist tiramisu and this one tasted as if it had been chilling in the refrigerator a while. I like the open kitchen concept and spacious wraparound bar area, as well as the lovely decor - I would give it another try. Great food. Great service. Very loud. Table in the middle of the room adjacent to bar not ideal. Feels like a divider or something to make the dining space more private or intimate is needed. Lighting too bright. Will return with high hopes for continued improvements as it finds its feet and for the rooftop bar in season. 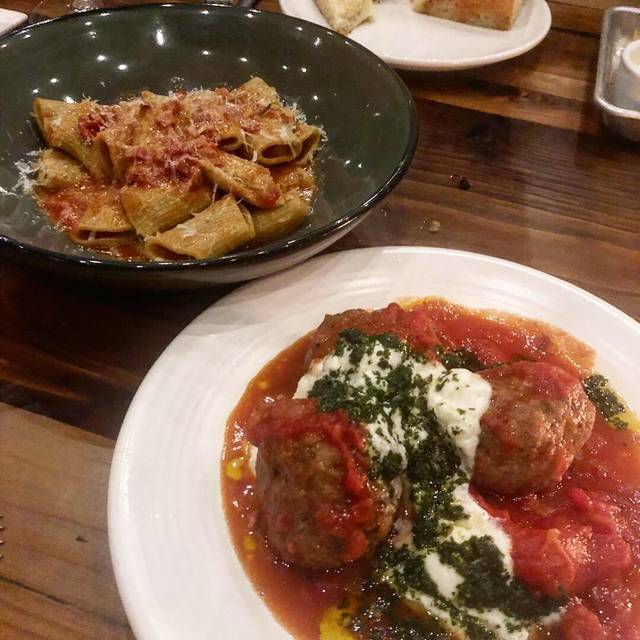 This was our second time dining at Felina's and we had a much better experience the first time. They still have a lot of kinks to work out. The meal from appetizers to entrees was delicious. The warmed burrata appetizer, scallops entree and Nutella budino were perfect. The rest of the table enjoyed the cauliflower appetizer, short rib entree, pasta with rabbit ragout and a lovely bottle of rose. A great atmosphere, albeit a bit loud - the overall experience was wonderful and I would absolutely return. Portion sizes were small for the price but food was very tasty with unique flavors. One of my friends was visiting from out of state, so we decided to go out somewhere new to celebrate some of the recent milestones in our lives. We went in for dinner on a Thursday evening and were warmly greeted by the Felina staff. We were seated in the center of the dining room, so we had the perfect view of everything. The bar, open format kitchen, vault room, and dining room as a whole were all so eye-catching, yet they each had such beautiful, individual details separating them. The space has an industrial vibe, but it is accented all throughout with feminine touches of flowers, plants, natural wood, and warm lighting. The aesthetics of the restaurant were one thing, but the food, beverages, and service were on another level! Our server was Alfredo, who was very kind, patient, and knowledgeable with the food and wine menus. He was helpful in figuring out vegetarian and gluten free options for my friend and I, as well as, explaining and offering suggestions on the wines by the bottle list. We started with a bottle of the Banshee Cabernet Sauvignon, along with the Romanesco Cauliflower, Pizzetta Bianca, Burrata, & Foccacia. 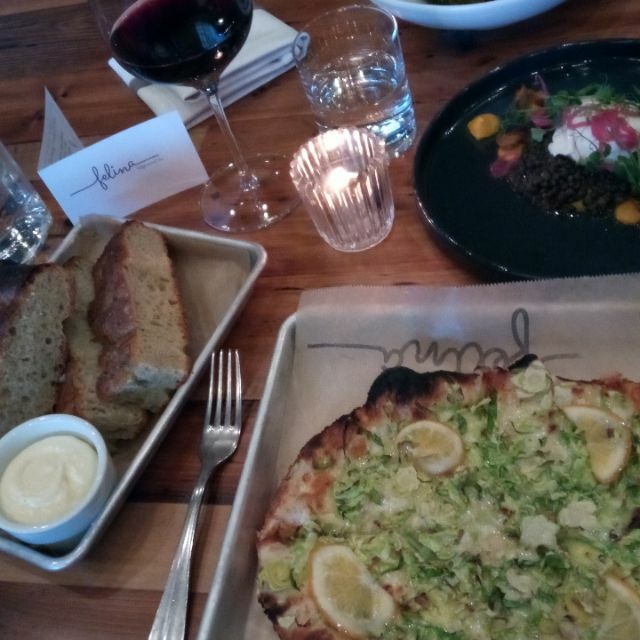 The Romanesco and Burrata were practically devoured and I honestly still dream about the Pizzetta and Foccacia. Mmmm all that carby goodness. For our next course, we both had the Black Pepper Bucatini (my friend subbed the Bucatini for gluten free Cassarecce) and we shared sides of the Fried Brussels, Carrots, and Crispy Potatoes. I loved the Bucatini and would definitely order it again, but the sides totally stole the show and were the perfect addition to our meal. We managed to save enough room for dessert and shared a Nutella Budino. "Saving the best for last" reigns true when it comes to the Budino - it's chocolatey hazelnut pudding goodness topped with fresh whipped cream, salted caramel drizzle, and gluten free cinnamon streusel crumble. All in all, my experience at Felina was wonderful and a night my friend and I will always cherish! The apace is beautiful it the food isn’t there yet. Also extremely loud! Crudo was sliced to thick , bucatini and clam shell pastas were way over cooked. One was very watery and bland and the other was thick and bland, almost startchy. Pizza was good . Short ribs over cooked and bland, no braising sauce. Everything needed salt for flavor . Drinks were good would go back and have a drink and app not an entire meal. Hope they can get their food to match their atmosphere. The food was Amazing! What a an outstanding space in northern NJ. No need to travel to NYC for a spectacular meal! Excellent food but the noise level in unbearable. Hard to enjoy when your ears hurt. The food was great (except for the side potatoes, ours tasted really weird) but we were seated 15 minutes after our reservation, and our waitress was MIA all night. Food was very good, staff very professional, restaurant nicely decorated. Only negatives were the wine by glass selection, need more variety with a few glasses more moderately priced. Restaurant is way too noisy, difficult to converse with the people at your own table. After hearing all the good things about Felina, I brought my two friends for a well deserved girl's night, and what a wonderful evening we had! We came in a few minutes after they opened, and watched as the restaurant filled up throughout the night. The venue's open kitchen and bar immediately invites you in, and the industrial vibe of the restaurant is pleasing to look at. Food wise, it was phenomenal. Every aspect of the menu is carefully tailored to compliment the ingredients used in each dish. 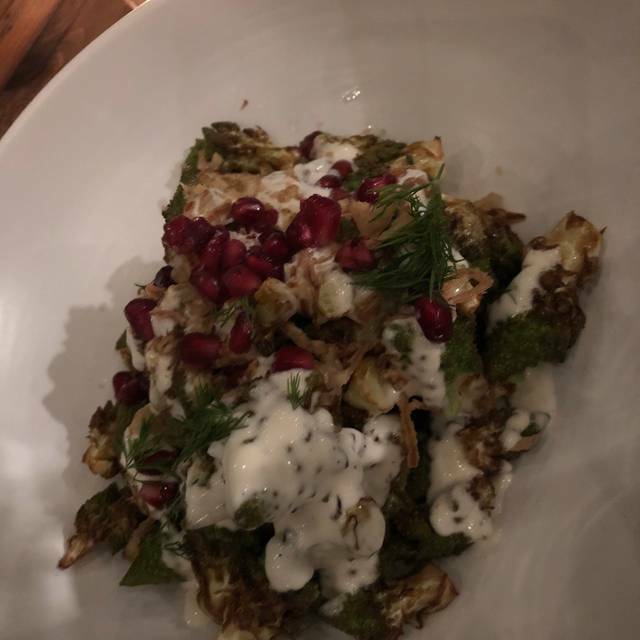 We started off with a few appetizers; the romanesco cauliflower was delightful, and their new addition to the menu, the bison tartare with fried sunchokes was incredible (highly recommend this, the sunchokes will change your life!!) My friend and I both got the amish chicken which was cooked to perfection, and my other friend got the short rib which was so tender it just fell apart when she touched it with her fork. And even though we were stuffed by the end, we still managed to find room for dessert. The tiramisu was the perfect after-dinner indulgence, and the nutella budino is an absolute dream to treat yourself with at the end of the meal. From start to finish, the service was warm and friendly, while also very attentive and present throughout the entire night. They were very knowledgeable about the food and drinks, being personable while remaining professional. It truly felt like they were happy to have us there, and we will definitely be returning again for the incredible food, inviting atmosphere, and remarkable service. It was my second time coming to Felina. I came when it first opened and I think it has certainly gotten better. I’ve heard that the weekends are buzzing so I dined on a Tuesday with my friend - it was also buzzing! But it was really nice. There was a special dinner going on in the restaurant in the bank vault area so that was cool to see the chefs making all the dishes at the counter of the open kitchen. 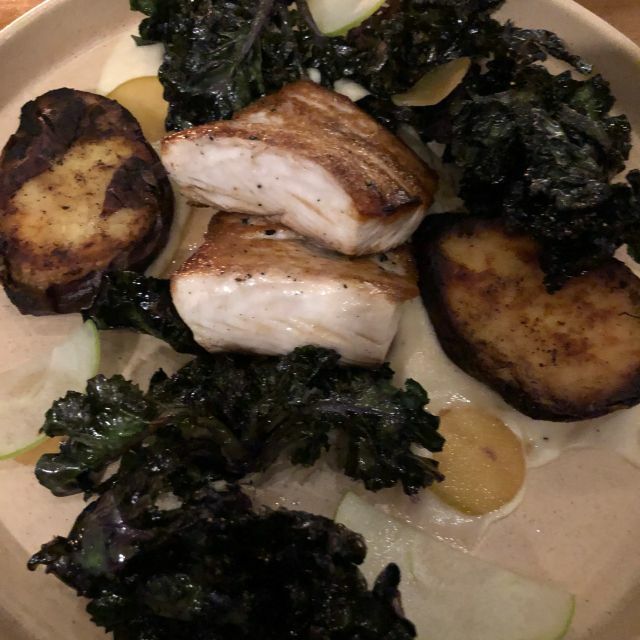 Our server said they have a lot of dinners and events coming up which I’m excited for such a new spot.. For food- We had the cauliflower and short rib dishes which were high lights as well as tiramisu. For two of us, we shared a few dishes and it was the perfect amount - we even took food home which was just as good a few hours later. The service was attentive and I loved our drinks. They have a very fun and different drinks menu which I don’t see very much of in North Jersey - I always see the same wines on every list but there was a solid Italian selection which I appreciate since those are my favorite and I look for funkier style wines with good value. Felina is here to stay - all my friends are talking about it and we are so excited for when the rooftop opens! I thought the food was good but the room was very loud. One thing that really annoyed me was that the waiter charged me for a premium gin (Hendricks) for my Negroni which I did not specify. Frankly with the Campari and Sweet Vermouth , a premium gin would have been a waster. It was only $2 so I didn't make a fuss but it's left a bad taste. The bill was $162 before tip which is not inexpensive for two people. I may go back but I'm not rushing there. Pasta portions were Poultry, we ordered an entrée sized plate to split and it was a child size. Noise level was unbearable, needed to yell to each other, couldn’t wait to get out to the street. Very drafty on a cold night,big bar scene. Not fine dining! terrific restaurant--great food, ambiance and service. Wine list a little pricey. I couldn’t wait to try this place. It very much lived up to my expectations. Everything from the friendly bartenders making a drink to my liking, to the gracious staff cleaning the plates off my table. Food was amazing, exploding with flavor with every bite. Can’t wait to go back. As you step foot into felina you’re immediately dumbfounded by the large, open floor plan of the restaurant. 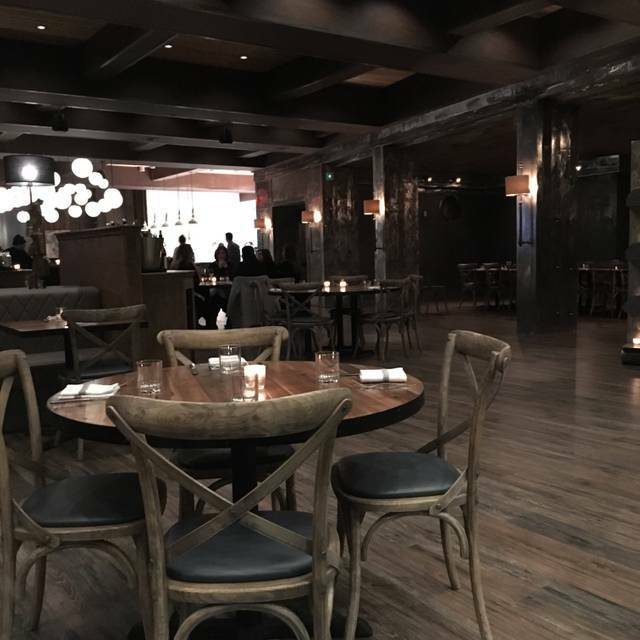 The mix of reclaimed materials (steel, wood) used in the interior adds to the rich character and inviting ambiance of the space, it made my jaw drop ever so slightly as I caught myself mouth the word ‘wow’. Service was spot on during our date night, our waiter Alfredo was a pleasure to converse with. Chef Anthony Bucco and his team brilliantly put together a meal that my wife and I won’t soon forget. This is a place to be seen in North Jersey, if you haven’t been to felina yet, do it, just go. Another really solid dining experience at Felina. Bison tartare, fluke crudo and Brussels pizza stellar! Loved the duck and rigatoni dishes! Cocktails are very good. Very strong!!! It’s officially our go-to Ridgewood restaurant! Spectacular, and memorable. Chef Anthony had a guest chef Tuesday. Amazing food and wine pairing was perfect. Recommend to all!! I'll be back! The good news about Felina is that it is a hip and stylish restaurant with great food. The ambiance was comfortable and the tables were spaced nicely for movement and privacy. Unfortunately, that was it as far as the positive aspects of it. The great food was way overpriced, the staff, although attentive, was pretentious. The drink pours were skimpy and the selection for wines by the glass was very pricy. Also, for a restaurant that is only a few months old, there shouldn’t be broken sink faucets in the ladies restroom, nor should I be sprayed with water when the toilet is flushed. I’m happy I tried it but not going back again. Our second trip to this new restaurant in Ridgewood. The food is v good but the service was fantastic. We will be back again. Cons : everything else. 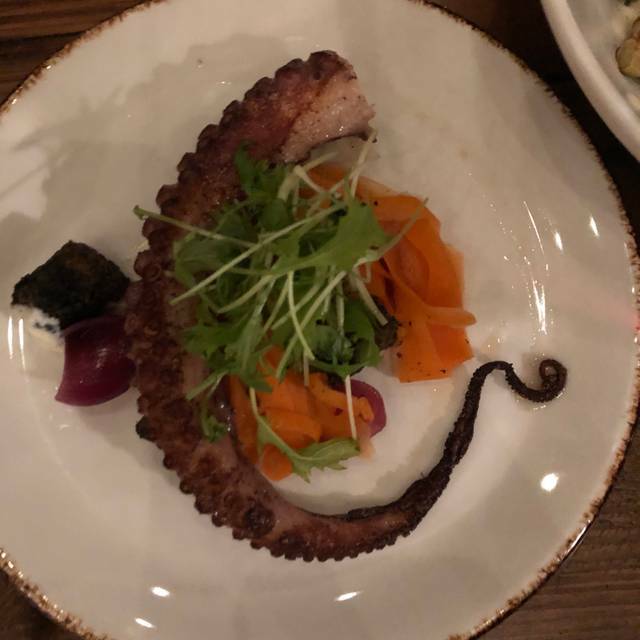 The octopus was chewy. The cauliflower appetizer was way too salty. Pasta with duck bolognese could have come right out of chef boyardee can - absolutely just terrible. 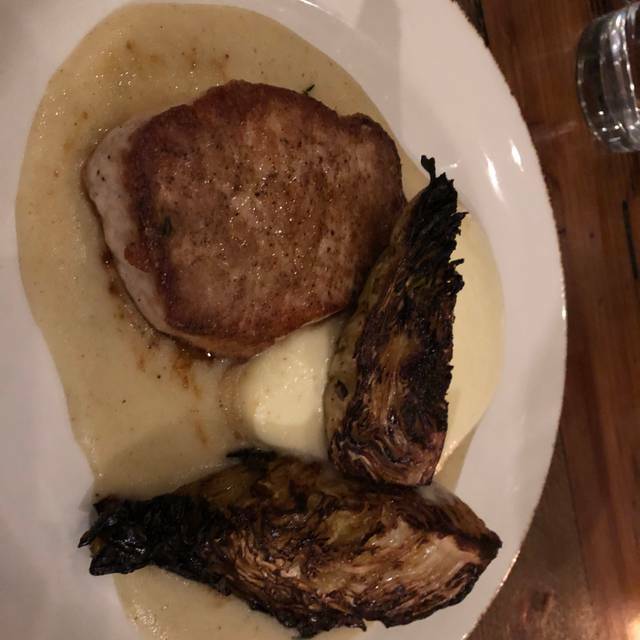 The pork chop while well cooked was without the bone. Wine bottle we picked was priced at $75 retail value at liquor store $20. I understand a mark-up but almost quadrupled the price seems a little ridiculous for a New Jersey restaurant. Overall, will not revisit this beautiful location. Overall the atmosphere was great but the restaurant was cold, there is on door to the outside which goes directly into the dinner room and it kept getting stuck so it you go in the winter bring a sweater. The focaccia bread was amazing but the rest of the menu need to have more detailed descriptions I ordered the Berkshire Pork overall it was good but it came with polenta which was prepared with apple vinegar and was okay but in was more like an apple sauce with vinegar not polenta and there was a sauce included that was not listed on the menu, personally I have food allergies so I like to have an idea of what I am eating. The dish components were okay separately some odd but together they were good. We also had the dessert and ordered the Nutella dessert which was excellent but the way it was described you would think you were getting a traditional baked strudel and it was a chocolate pudding with crumbles very good but totally different then what you received. If you like an adventurous menu this is a place for you if you want less mystery consider a different place since the table next to us was having the same issue and had to have their entrees verified it was what they ordered. The decor of the restaurant was beautiful. The food was outstanding. It was our first time at Felina and I would definitely go back and I’ve already recommended this place to others. God awful! Served cold and tasted frozen. DO NOT GO! The restaurant looks great, nice big bar, if you can get close to it. It’s very loud between the crowd and the music. The food was quite good, the prosciutto appetizer delicious. The pork was a little dry, maybe over done, the short ribs very good, but a small portion. The focaccia is delicious but costs extra. The apple tart was very disappointing, really dry. Overall we enjoyed our experience at Felina, but not sure if it will become a regular spot for us in a town with tons of good restaurants. Felina did a great job in redoing itself. It is a beautiful space. The only problem is that it is extremely noisy. It was very difficult to hear the waitstaff as well as our dining companions. The food was interesting and very good. The waitstaff was very helpful and attentive.